Where would you be going dressed like this? For what event is this attire appropriate? The Three of Expats from California have dressed up for some occasion. 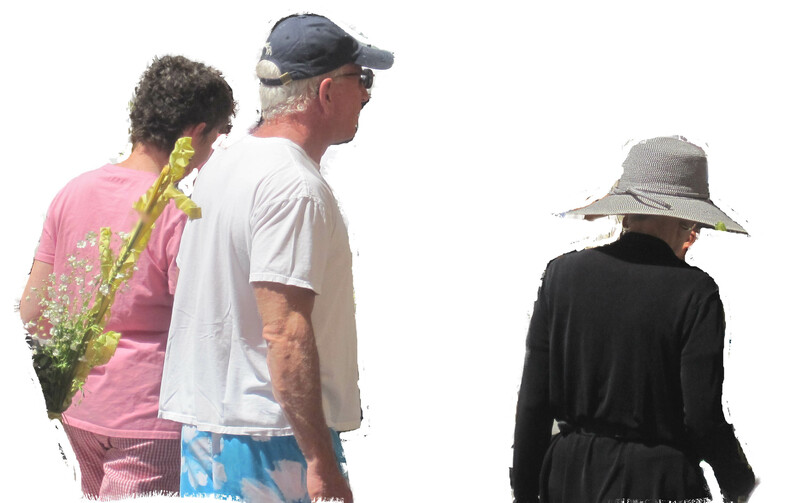 The Beach Boy, the Pink Lady and the Black Widow are going somewhere together. Can you guess? ; The Beach, a BBQ? 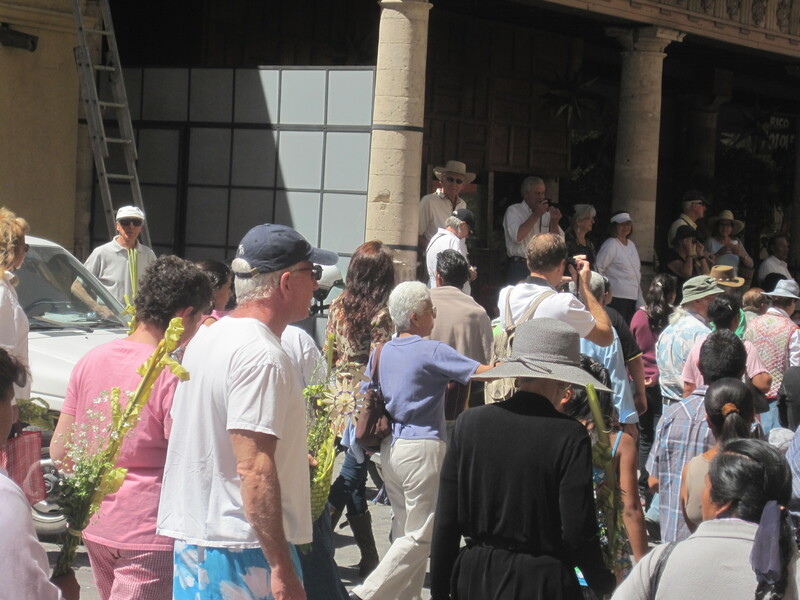 At 11 am, a somewhat more polished but perhaps less touching procession leaves the Parroquia. 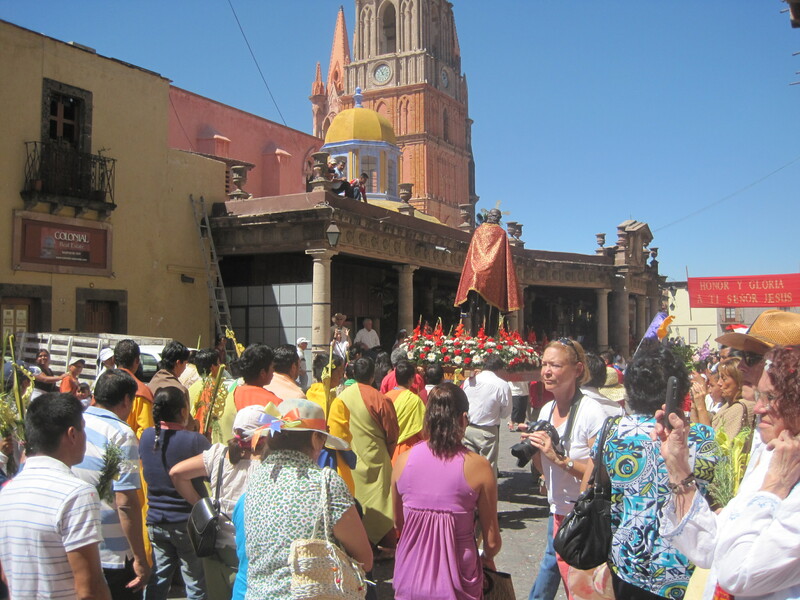 This time, Christ on the donkey is a medium-sized statue borne from the Santa Escuela Church, beside the Parroquia. Christ wears a flowing scarlet robe; the donkey seems to sport a rather bemused smile. 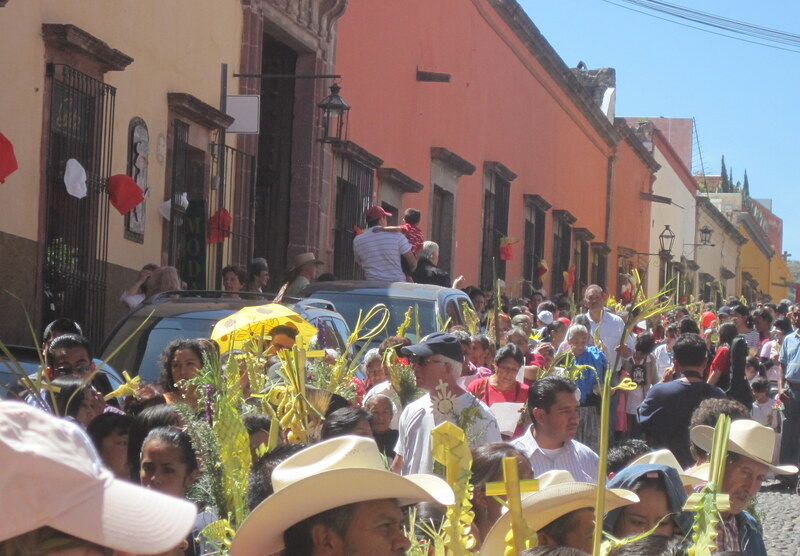 Preceded by conchero dancers in their bright regalia and trailing feathers and followed by hundreds of participants waving palm fronds, the procession moves down Calle Correo, turns left into Corregidora, then into San Francisco to circle the Jardín. 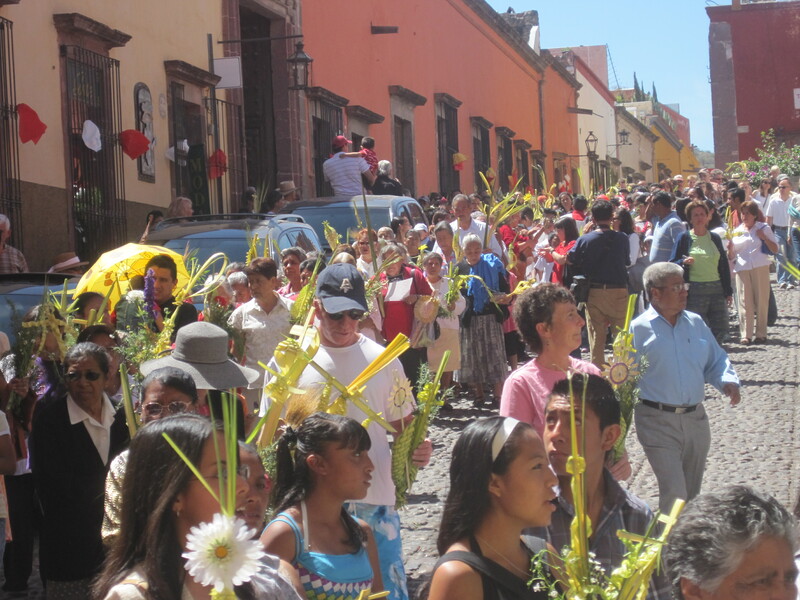 Amid the sound of drums, trumpets and church bells, it returns to the Parroquia. Hey Gals, how about joining the Parade instead of just watching it. We are dressed for it and we got one of those things we can carry. 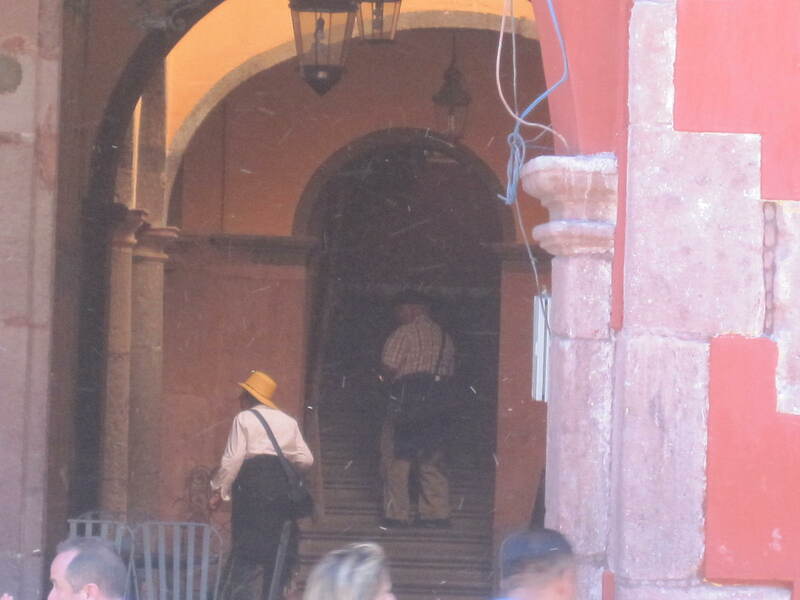 March 29th was Palm Sunday and the San Miguel Sniper came to town looking for Victims. You don’t expect to find Snipers on Palm Sunday but she was there. She brought her Camera and began Sniping. You know she is a Sniper because most important part of the Procession is of no interest. No one was safe from the Sniper. The Sniper first surveyed the Parade Participants. She is looking for Victims. She wants to get that First Shot off. Then she finds a victim. 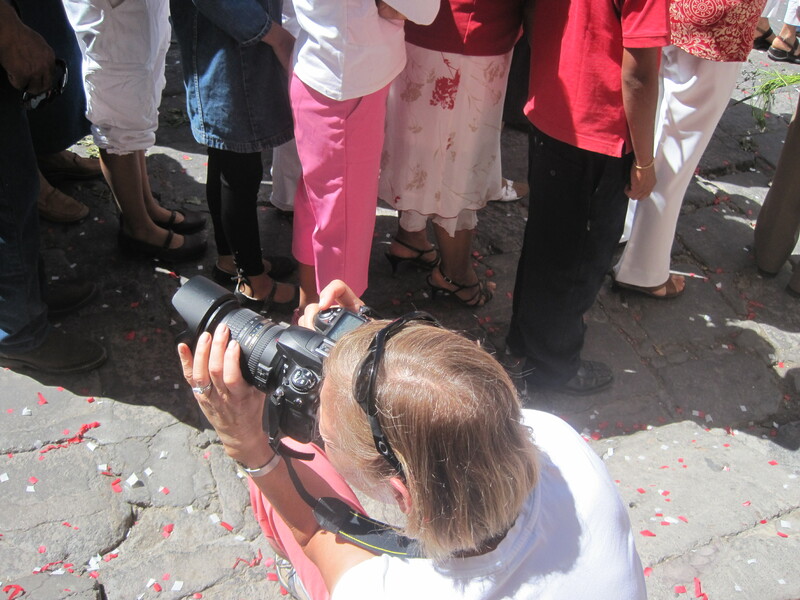 You can never be sure who she is going to pick out of a crowd to shoot. Snipers have their own code of behaviour. Anyone can be a victim of the sniper. She ducks down below the crowd. She points her Gun and shoots. 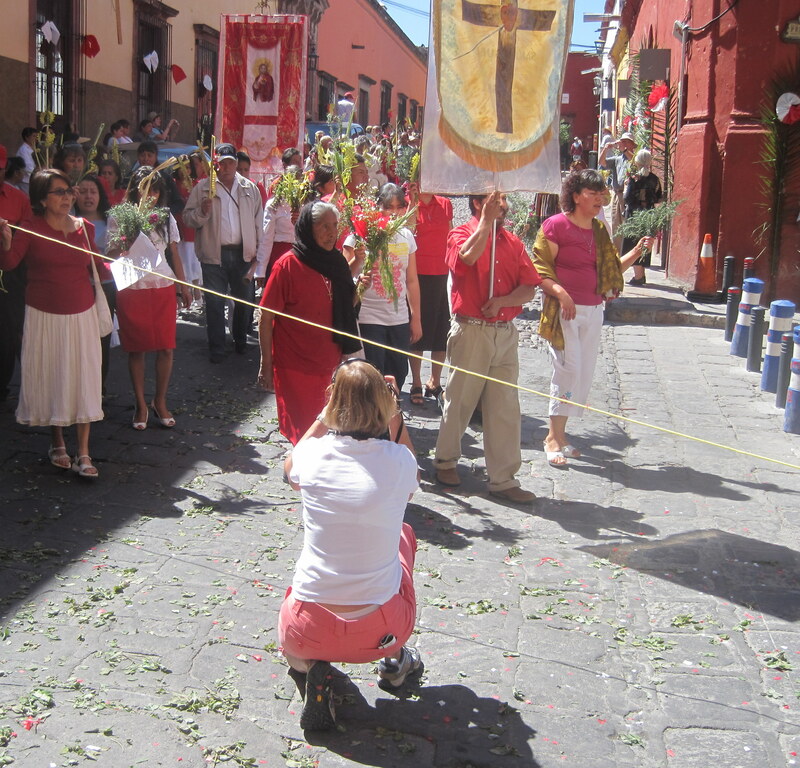 One more participant in a Palm Sunday Procession is shot. 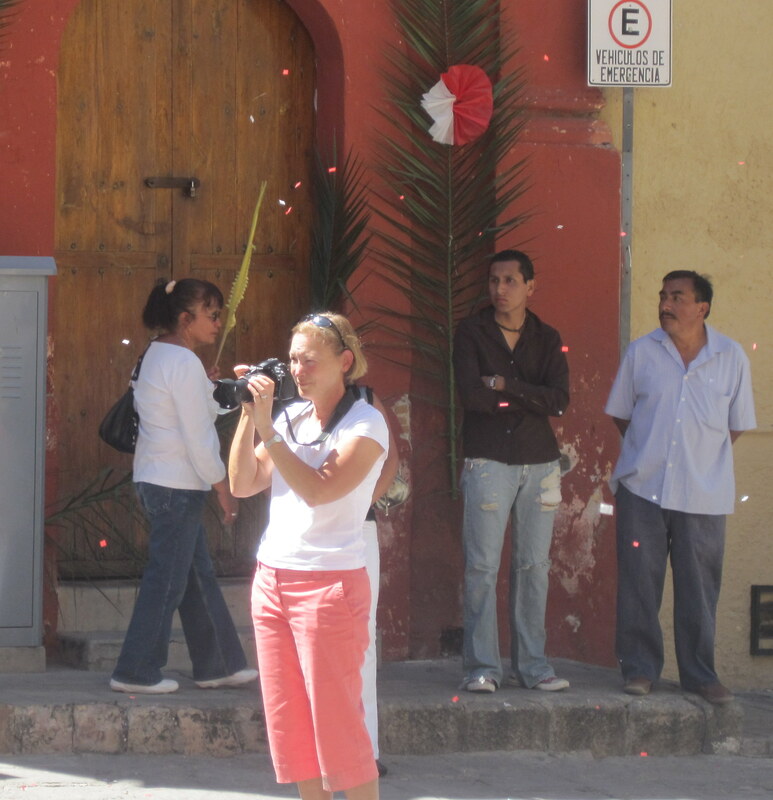 She likes to get in front of the Procession to get that Good Shot in. 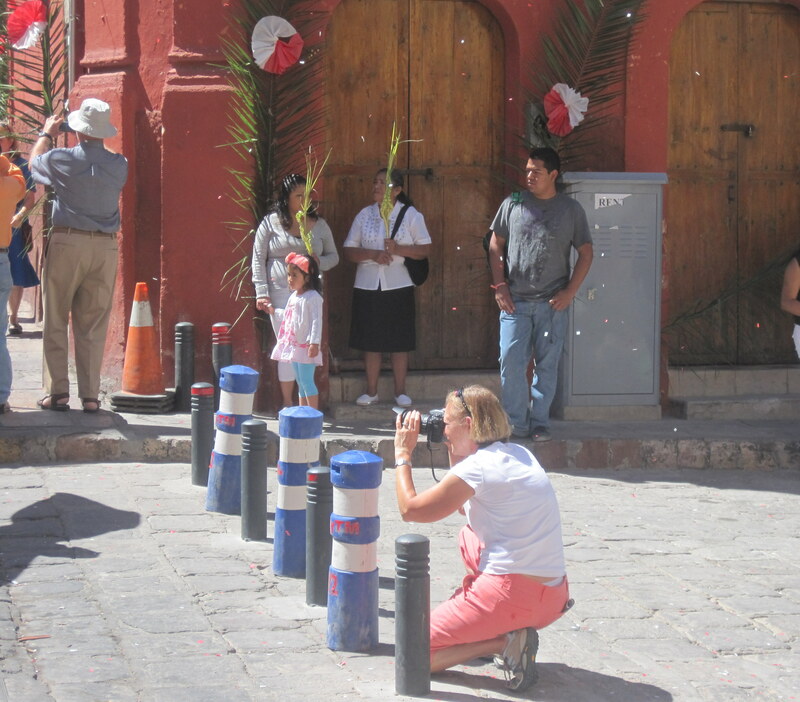 No one is safe from the San Miguel Sniper. No child, no Grandmother, no priest, no nun. She doesn’t care who she shoots. Imagine the fear you would feel when you look down and see that the Sniper has you in the Cross Hairs. She is going to shoot you. I am fascinated by nuns. Several days ago I was at a cocktail party on Umuran on the terrace. The bells started ringing and I looked up to see where it was. 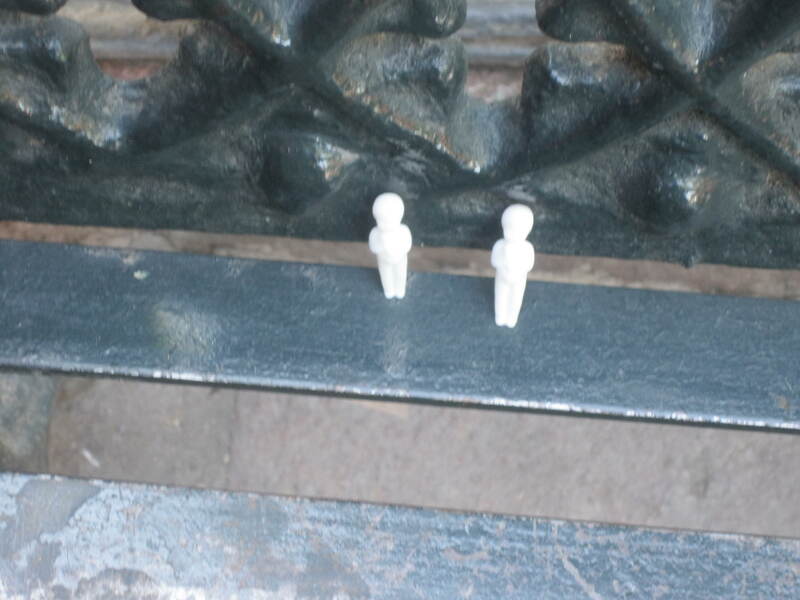 To my amazement, two strong, white clad nuns were ringing the bells. I could not look away. I was not expecting Bell Ringing Nuns. Then I was told by someone at the party that the nuns sell cookies in the convent. You knock on a little wooden window and ask for cookies and they sell them through the window. What do nun cookies look like? 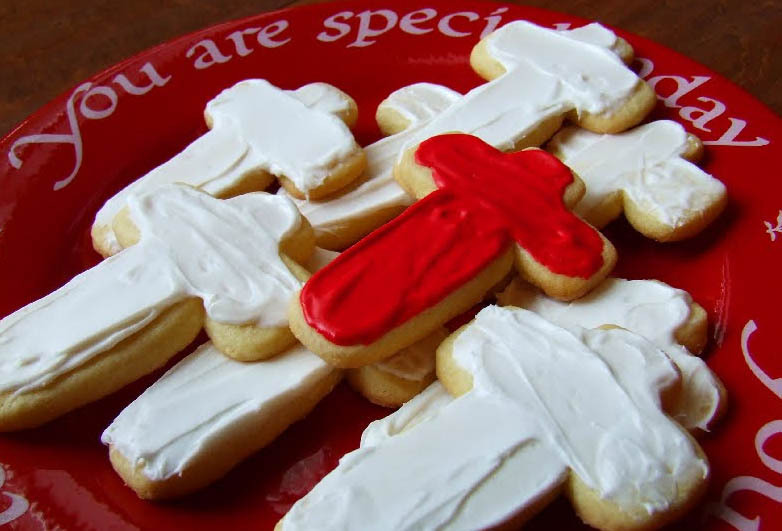 Could you eat cookies shaped like a nun? What part would you eat first? It is like the gingerbread man. 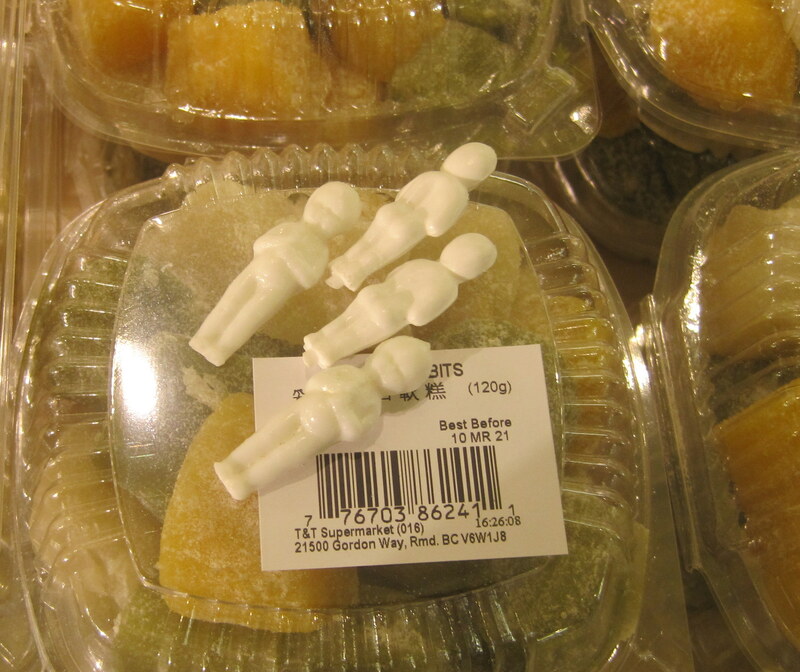 I always ate the legs first. 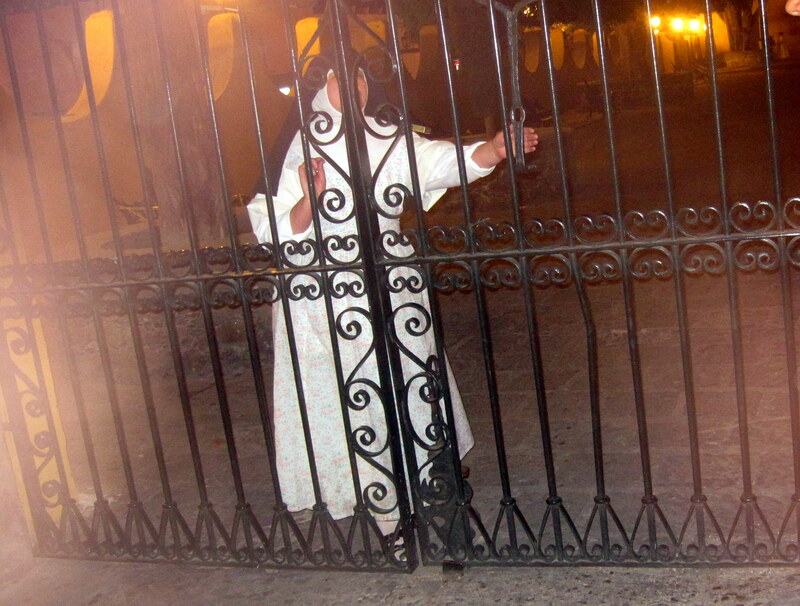 Then in the picture above the nun locked us out. One of my favorite expressions about retirement is Filling the Hours. I don’t go to the Jardin often to Fill the Hours but I had an hour to fill the other day. 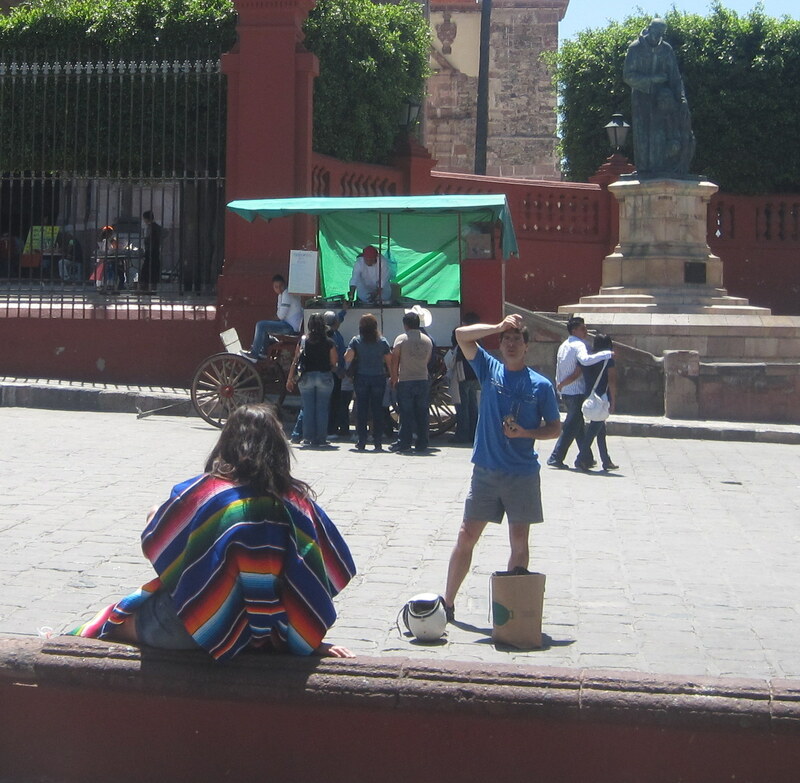 I always sit there with my camera and spotted this woman in a serape sitting on the wall. I was puzzled why she was sitting that way, dressed like that. As I stood up to take a better picture I saw Photohubby. He was directing Photowife for a Photo. 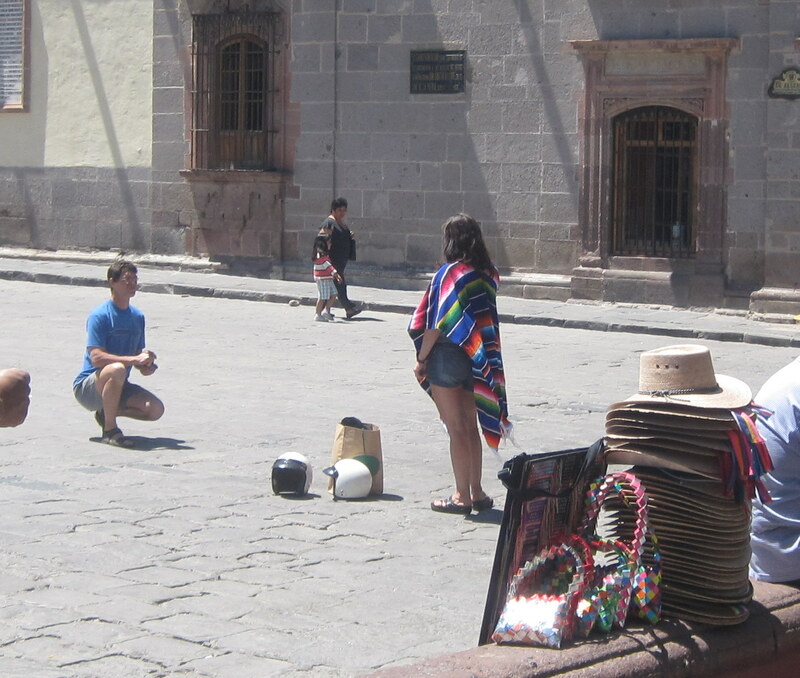 He sort of missed that the Parroquia was behind him but he had some reason to ask Photowife to sit like that. 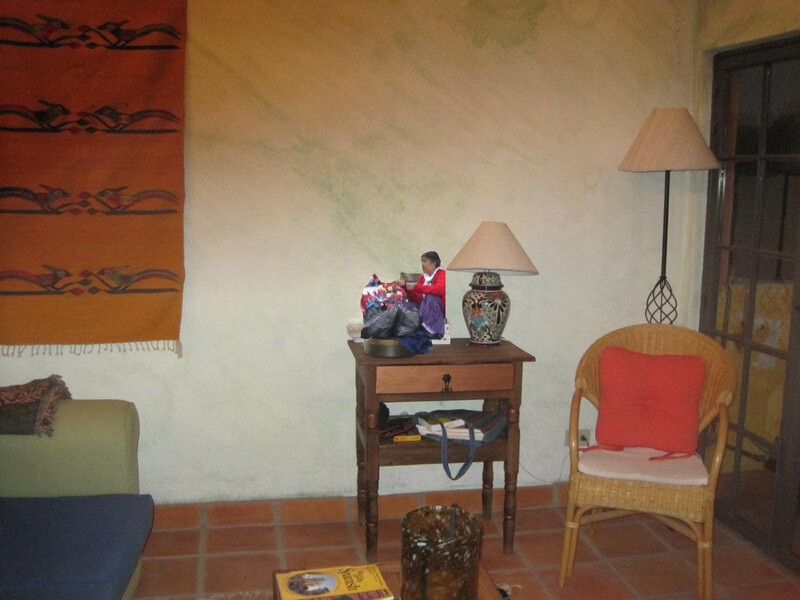 Perhaps is was some Mexican fantasy he had about Photowife in a serape sitting on a wall. He was at it for quite a while. Then he asked her to stand up. Again I wasn’t sure what this new pose was about but Photowife was a good wife and stood up. I don’t know what happened next as I had filled the hour and went home. This gang collects pictures of Beggars. Not sure why she wants pictures of Beggars nor who would want to see pictures of Beggars but this Photographer is on a Beggar Hunt. Even the Beggar gets into the act and plays the part of a Beggar to perfection. 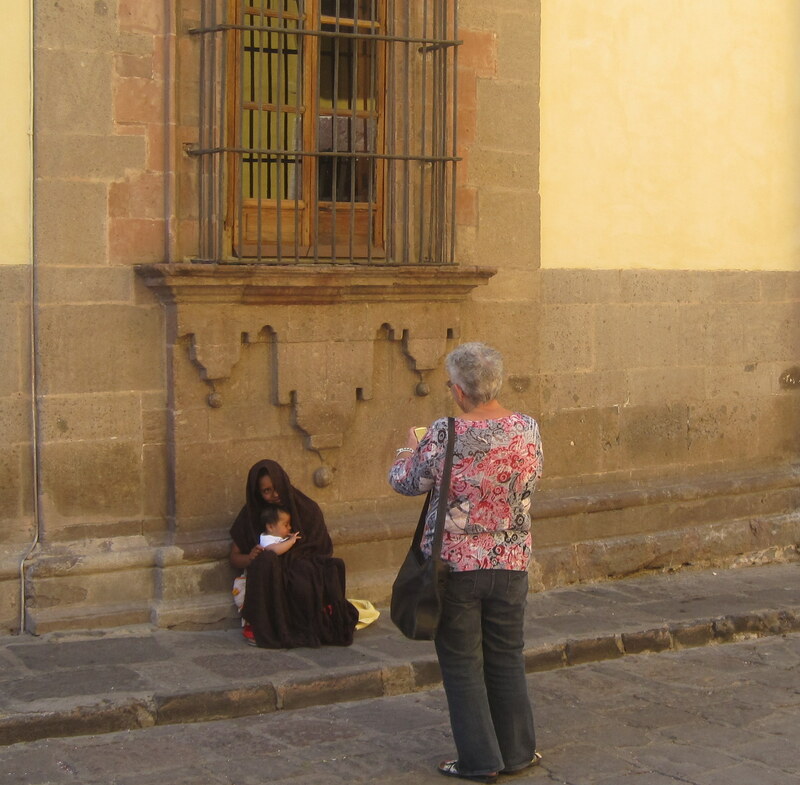 The question is whether or not the Photographer gave her any money and validated her as a Beggar or simply thought it was part of San Miguel Disney. Being an artist means creating a sense of mystery. Do you know who that is? means that people are paying attention and are picking up your Artistic Aura. 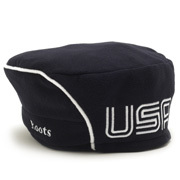 No one but an artist and some athletes who wore Roots Berets during the Olympics. So I have spent a lot of time lately, walking by people in my Beret and disappearing into Artistic Places. This day I decided to climb up some stairs in one of the buildings near the Jardin. I wonder where that Artist is going. 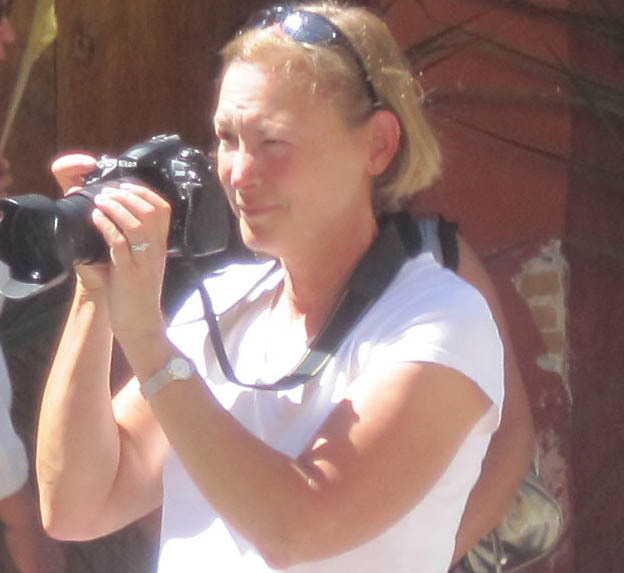 She thought it time that she went home with her children and show her family how she was spending her time in Mexico. Mary had to slow the car down as they got closer. The children huddled on the dashboard. There are tough seat belt laws in Ontario and in particular for children but Mary’s Mexican born children didn’t care. 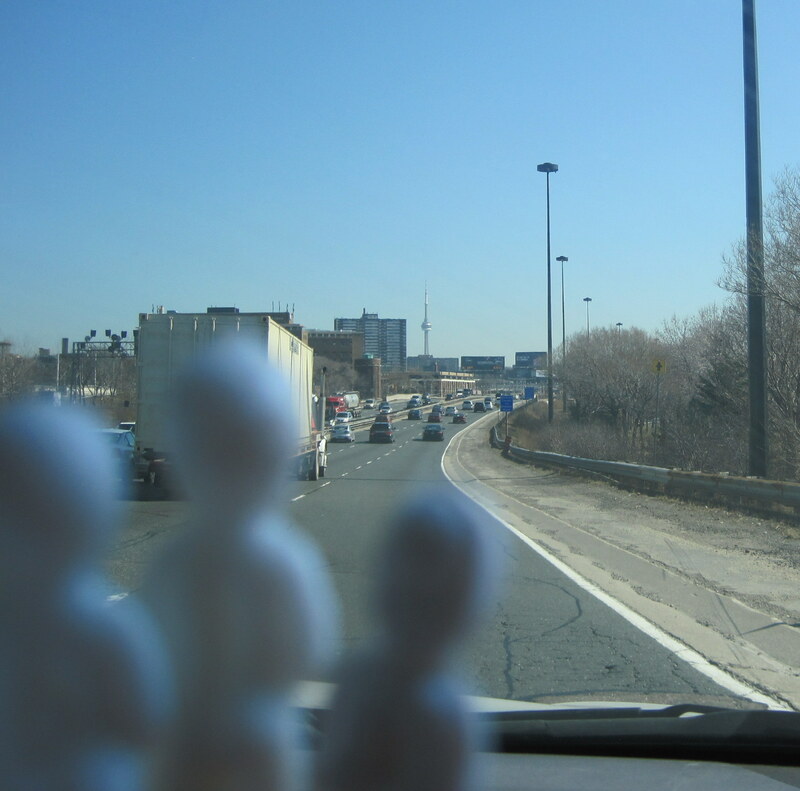 They wanted to see the CN Tower and did. 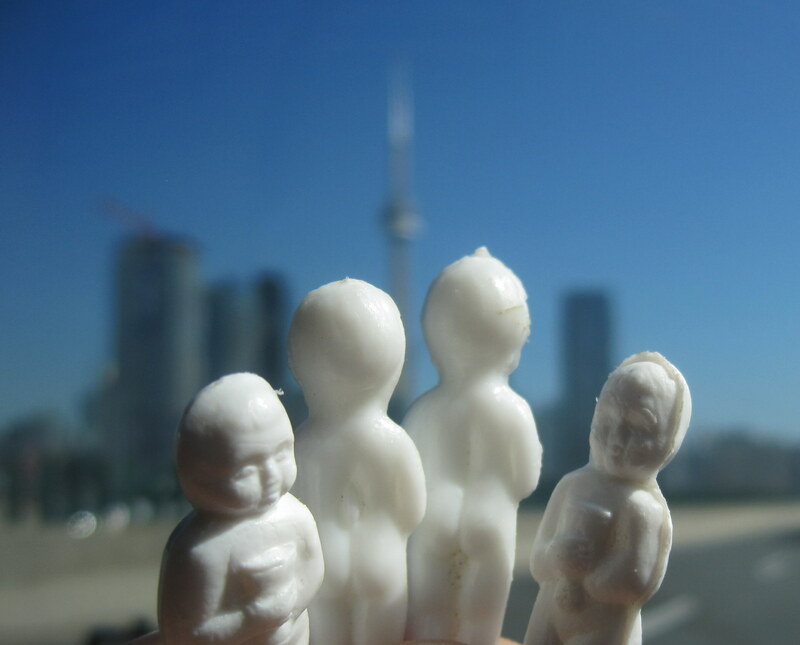 They particularly enjoyed the view of the waterfront and the CN Tower as Mary held them firmly in her hand to get a good view. It is difficult being that small and trying to see things. 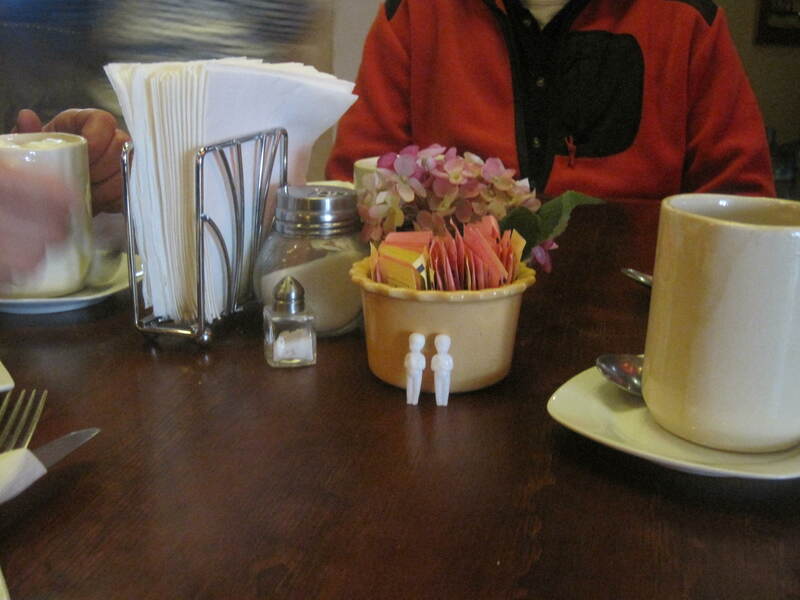 Of course, they had to experience Bakery given their birth experience. Mary left them among the baked goods as she shopped in T and T and the children were covered with crumbs when she returned. She didn’t stay long in Canada. Her parents didn’t welcome the illegitimate children as grandchildren. The final straw was when her mother put all four children in a box of toys and closed the lid. 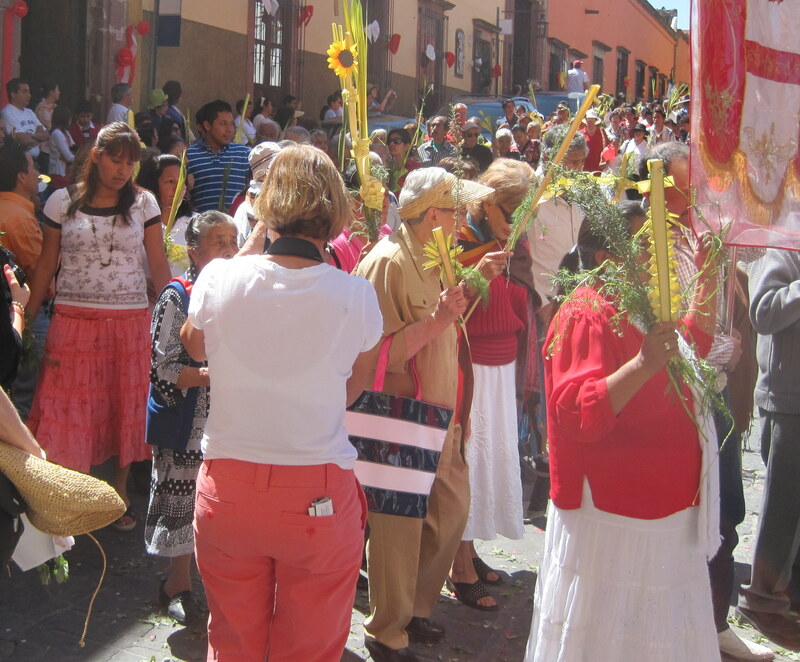 Mary couldn’t take this cruelty nor her parents lack of joy in having grandchildren and has returned to San Miguel where the Magic never leaves. 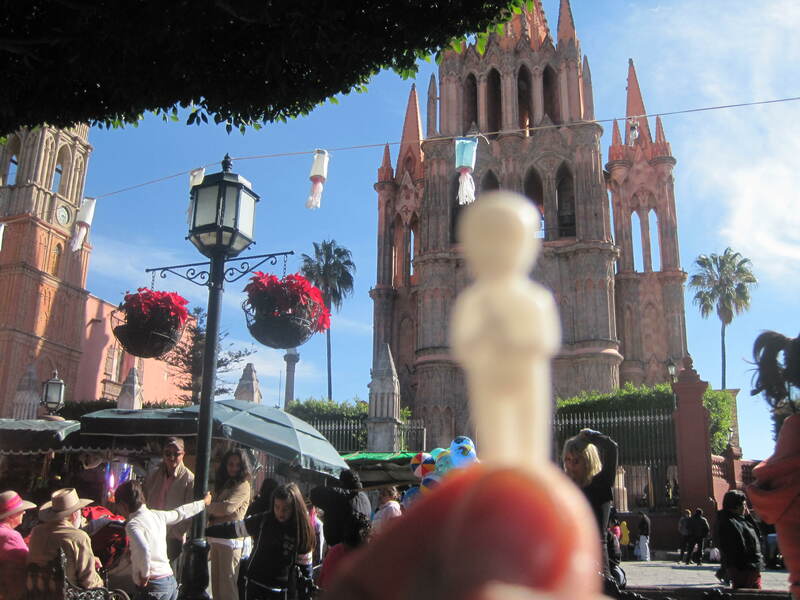 The ongoing theme of Magic In San Miguel is shown again with our own Lady of the Lake. She takes her theme from Arthurian Legends. The Lancelot-Grail Cycle provides a backstory for the Lady of the Lake, “Viviane”, in the prose Merlin section, which takes place before the Lancelot Proper, though it was written later. There, Viviane learns her magic from Merlin, who becomes enamored of her. She refuses to give him her love until he has taught her all his secrets, after which she uses her power to trap him either in the trunk of a tree or beneath a stone, depending on the story and author. Regardless of the specific version, Merlin is unable to counteract Viviane because of his foresight; because of such an ability and “truth” it holds, he decides to do nothing for his situation other than to continue to teach her his secrets until she takes the opportunity to entrap and entomb him in a tree, a stone or a cave. The Monty Python Troupe updated the legend in the musical Spamalot. Arthur attempts to convince a peasant named Dennis Galahad that he, Arthur, is king of England because the Lady of the Lake gave him Excalibur, the sword given only to the man fit to rule England. However, Dennis and his mother, Mrs Galahad, are political radicals and deny that any king who has not been elected by the people has any legitimate right to rule over them. To settle the issue, Arthur has the Lady of the Lake and her Laker Girls appear to turn Dennis into a knight (“Come With Me”). Cheered on by the girls (“Laker Girls Cheer”), the Lady of the Lake turns Dennis into Sir Galahad and together, they sing a generic Broadway love song (“The Song That Goes Like This”), complete with chandelier. They are joined by Sir Robin and Sir Lancelot, and together with Sir Bedevere and Sir Not-Appearing-In-This-Show (a knight resembling Don Quixote, who promptly apologizes and leaves), they make up the Knights of the Round Table (“All for One”). 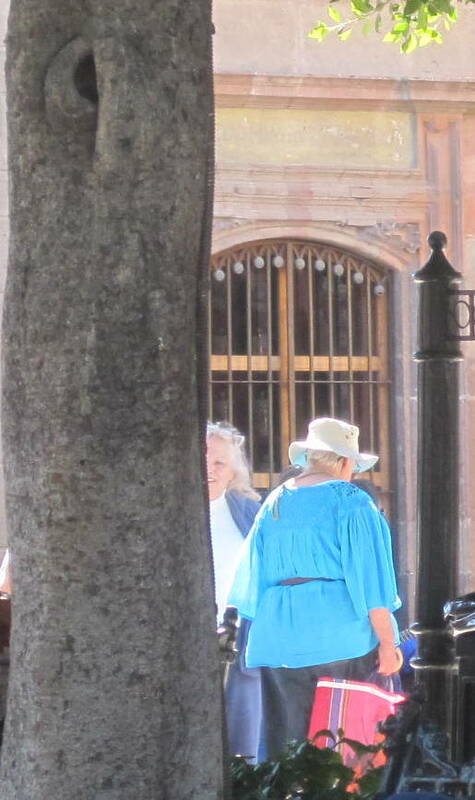 In San Miguel we have our own Dama del Lago. La Presa is a gigantic lake in San Miguel where our Lady of the Lake lives. Our little well not so little Lady of the Lake, Viv, comes into town periodically to entrap men in stone or tree or Harry’s during Happy Hour. Beware of the trees in the Jardin. There are men trapped in them. Oh dear, I can now see all the single women in the Jardin now with axes. Mary always struggles with the issue many parents do about whether or not to take the children to a restaurant. 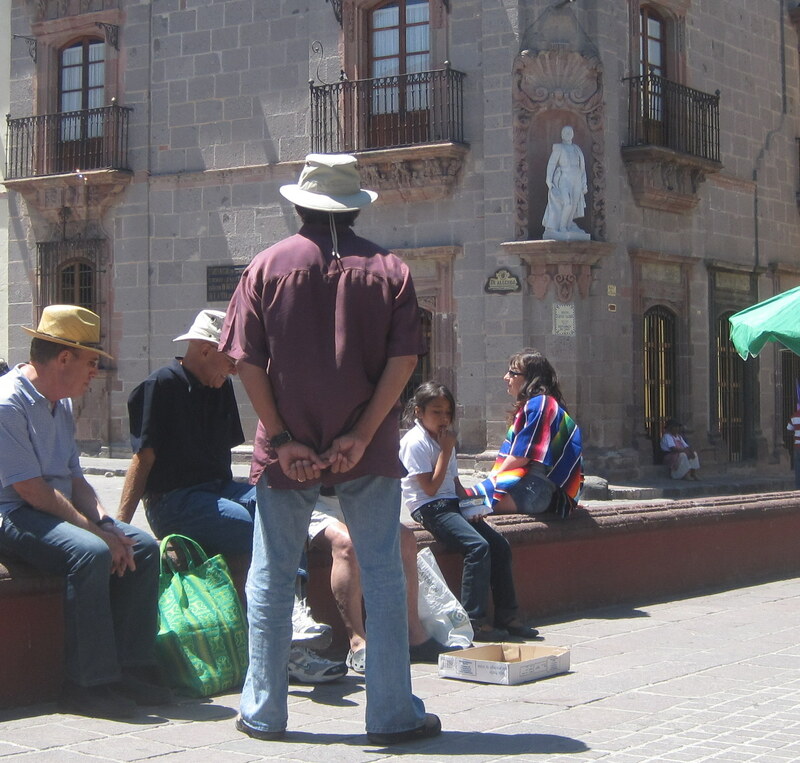 There are few children in San Miguel and she always gets looks when she brings the children anywhere semi adults hang out. While they are finished with child rearing, Mary in the later part of her life is just beginning her long long years of child rearing. The children because they came from a food experience, they seem to be attracted to anything that might have come from a bakery. 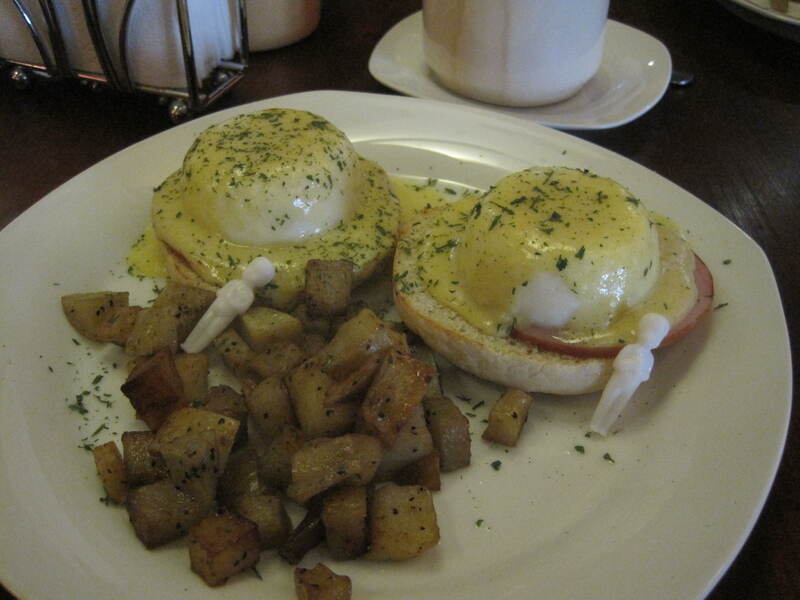 These muffins under the Eggs Benedict were especially tempting to them. Up they hopped and nestled by the muffins. Mary knew people were looking at her and her inability to control the children’s desire to not only play with food but to be with food. She finds the Jardin better for the children as the food is less accessible. The children just sit on the iron benches while Mary chats with her friends. Occasionally they slip away and Mary has to retrieve them and reposition then again. I have stumbled on a little find. I saw photographs displayed in an Art Gallery. At first I though they were advertising local restaurants and bars but when I looked carefully I saw that there pictures of people and buildings and skies. They were on display as Art. I didn’t know you could take a picture and call it Art. We used to just call those Snaps. As I started to talk to people in the galleries, I heard them talk about famous photographers such as Anson Williams. I thought he was an actor in Happy Days but they talked on and on about him and other people I had never heard of. This gave me an idea. All you need is a camera and a snap. So I found this picture of a flower seller in the Jardin and Voila (I do like to speak in tongues) I had some new art.